Projects Abroad’s Director of Conservation Stuart Timson will be spending this Christmas Day at the Taricaya Lodge in the Peruvian Rainforest. 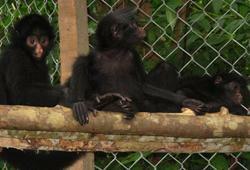 It is an exciting time this year as five spider monkeys will be released into the rainforest. So whilst you are sitting down to your turkey and Christmas pudding there will be five monkeys returning to the wild. Check out the Peruvian Conservation page for all the latest updates on the animal release program and the rest of our conservation efforts in Peru.